All versions of Power Cards Now Available. We all remember the old milko as he did his rounds and did the milk deliveries Darwin or do we, yes that was a long time ago. Well Winnellie Supermarket has bought back the theme for Businesses in Darwin and Palmerston. We have 2 ways to order one is a standing order where you get a set number of milk a week on a certain day, we roc k up and put straight into your fridge. The second way is call and we will send your milk with the next delivery. The majority of our customers take the set delivery option. 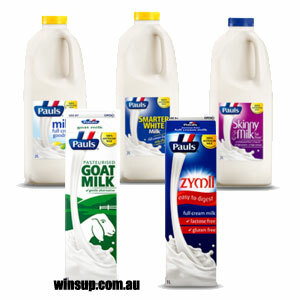 This is a very good question, currently we sell Pauls 2 milk variety’s , 2l trim , 2l slim, 2 litre fresh , 2 litre smart as well as 1 litre’s of the above including Pauls Zymil Milk and Goats Milk. Delivery Cost and Benefits: We charge $6 dollars for Winnellie delivery and $12 dollars for delivery for Darwin and Palmerston, at the agreed time or in our schedules this includes us putting it in the fridge for you. For this charge we will also pick up your mail , not including large parcels. Your letters must already have stamps on them and we simply take them to the post office on our daily mail run. staff has to put milk in fridge. I have had regular milk deliveries to Winnellie for years and these guys have never missed a beat. Thanks, Lisa we love the feedback and we love delivering to you. Fantastic service and lovely people. Would highly recommend!